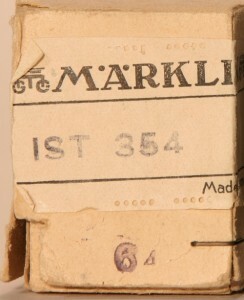 In the previous post on Marklin boxes (Part I), I discussed my theory on the patterns of the stamps and print codes using only a small selection of some 1945 boxes. Now I will move on to discuss the print code theory on a much larger sampling of boxes and test the validity of this theory. 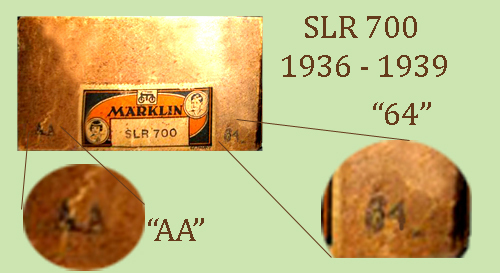 Here we can see two markings on the box other than the typical 1930s orange and black label from Marklin depicting an “SLR 700” locomotive. The first, a stamp of “64” and secondly, a stamp “AA.” Following the stamp sequence described in Part I, we can deduce the “64” as meaning the 4th quarter of 1936. 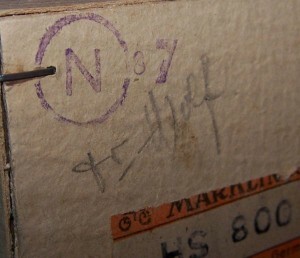 Given production dates of 1936 – 1939 for the SLR 700 locomotive, the two dates provide a strong correlation and we can tell that this box belongs to a Version 1 SLR 700 locomotive and not surprisingly, it does. As to what the “AA” means, I have not a clue. 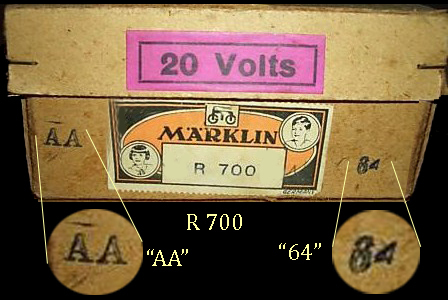 I can only guess that there is a correlation between the “AA” and the fact that I have only seen this on the earlier boxes from 1935 – 1937. Perhaps an indication of the earliest HO production materials? In the past we have seen “A” marked on transformers as being for the USA (American) markets, but here I do not believe it is the case. 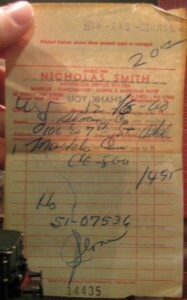 For some of the later years (1950s), one might ask if this same dating procedure still applies. The answer is yes and no (because I don’t know). 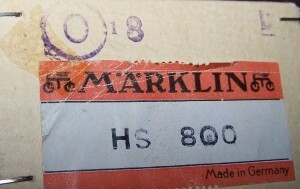 As Marklin became more advanced and printing could be done with more than just a stamp, the print sequences and codes became much more complex. However, I must note a particularly obscure example of a box from “FEB 1951” (picture below) that clearly spells out the production date. Unfortunately this is not the case for all 1950s materials. 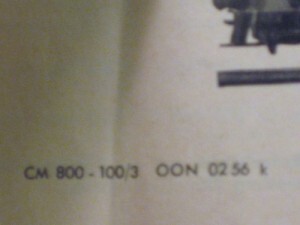 CE 800 Instruction sheet "02 56"
The corresponding box with which the original locomotive was sold (including above instruction sheet) has the stamp “8 2 6.” From the information gathered above, we can determine that the “2” corresponds to “February” and “6” to “1956.” Now we have related our catalog/instruction sheet print codes to the codes used on the boxes. 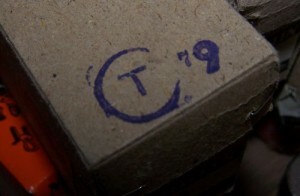 CE 800 BOX - STAMP: "8 2 6"
For some further support to the theory, we can look at the original receipt included with the purchase of the above CE 800. 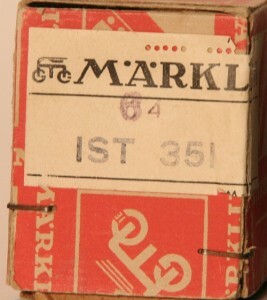 Notice that all dates on the boxes correspond to appropriate production dates of the locomotives. 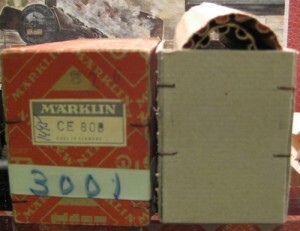 Images courtesy of Markus K.
What else could we possibly want to learn from the boxes? Well I sure would like to know what the “T,” “O,” and “N” represent? 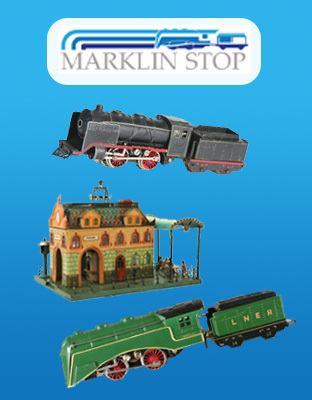 This certainly reminds me of TOYMARKLIN, but could we possibly use that here? But newer models have letters that do not fit the TOYMARKLIN letter pattern. 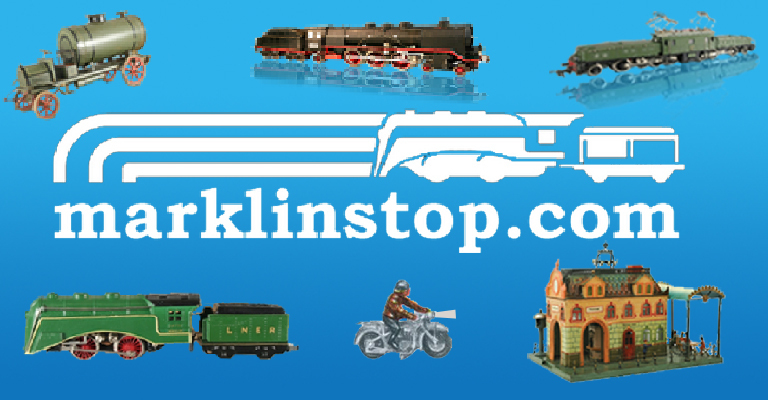 I think I am even closer to finding out the never-before-released estimated production numbers of Marklin locomotives (a big Marklin secret). Wait for Part III! Even more interesting! Thanks again very much.